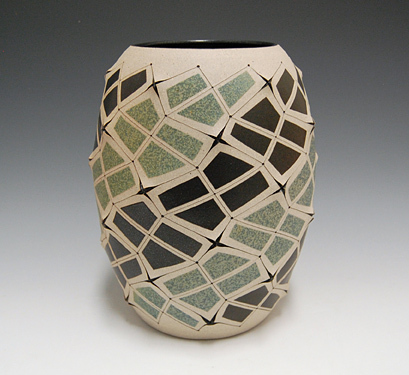 My gallery is well known for specializing in contemporary ceramics. That’s been beneficial in gaining attention from other worlds, particularly the professions of design and architecture. Just recently, Don Chadwick, the designer of the world-famous Aeron chair came to see us again at the gallery. He’s interested in the use of the hand by our artists, and, in turn, I asked him to autograph my Aeron chair. Architects also seem to be fascinated with ceramics. Could some of the interest from architects be related to the plasticity of the material? Two architects that I know have an affinity for the intimacy of small scale sculpture, and close relationships with artists. When Frederick Fisher was designing my gallery, he told me that he conceived of the large volume of space as a container of smaller sculptural forms. His knowledge of individual sculptors led him to design a series of appropriately scaled modular boxes within the larger building. 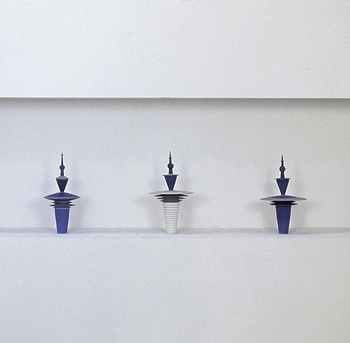 This intersection of architecture and art specifically referenced ceramic sculptors’ work, as Fred included works by Adrian Saxe and Roseline Delisle in his first concept sketches. 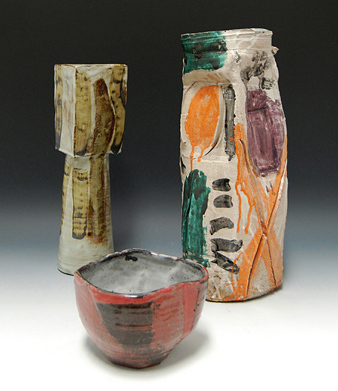 Frank Gehry also has a long history with ceramic sculpture. From his early encounters with Glen Lukens at USC to his recent design of the Los Angeles County Museum of Art’s retrospective for Ken Price, Gehry has maintained an interest in the scale and tactile intimacy of forms made in clay. Gehry’s art collection includes works by Ken Price and George Ohr, and he has been friends with ceramic artists Peter Voulkos, John Mason, and Billy Al Bengston for decades. 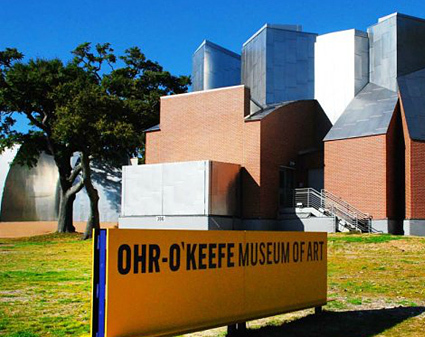 He was also the architect for the Ohr-O’Keefe Museum in Biloxi, Mississippi, a museum which holds a collection of pottery by George Ohr. Inspired by the Getty’s holiday card – a video narrated by James Cuno outlining the Getty’s accomplishments of 2012 – I decided to take a look at the happenings of the past year here at the gallery. In January the gallery opened Peter Voulkos in L.A.: Time Capsule, a show that critic Peter Frank hailed as “…the kind of show Pacific Standard Time has been all too short of: an intimate look at the taste and thinking and working methods of an influential figure. Everything in the show, drawn from the artist’s daughter’s collection, was small in scale and dated from the later 1950s…” in the Huffington Post. 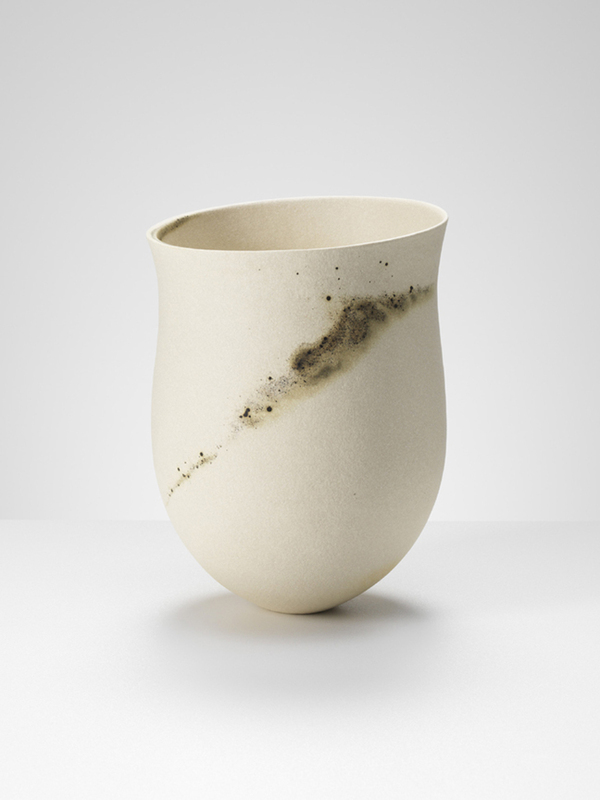 Drawing on Japan’s significant history with ceramics, the gallery presented Sugimoto Sadamitsu’s work in February. Sugimoto-sensei is regarded as the greatest living master of the Iga and Shigaraki styles, and his work was highlighted in a 1989 exhibition that celebrated the 400th anniversary of the death of Sen no Rikyu, the legendary early master of the Tea Ceremony. 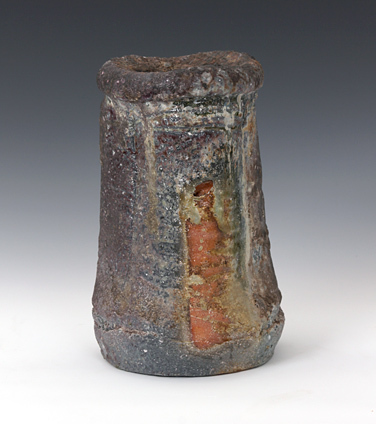 Sugimoto-sensei’s work represented Shigaraki and Iga masterpieces of the Momoyama period for use in the movie made in that year titled Rikyu, a well-received treatment of the life of this master of the Tea Ceremony. Our show was the first appearance of Sugimoto-sensei’s work in the western United States. 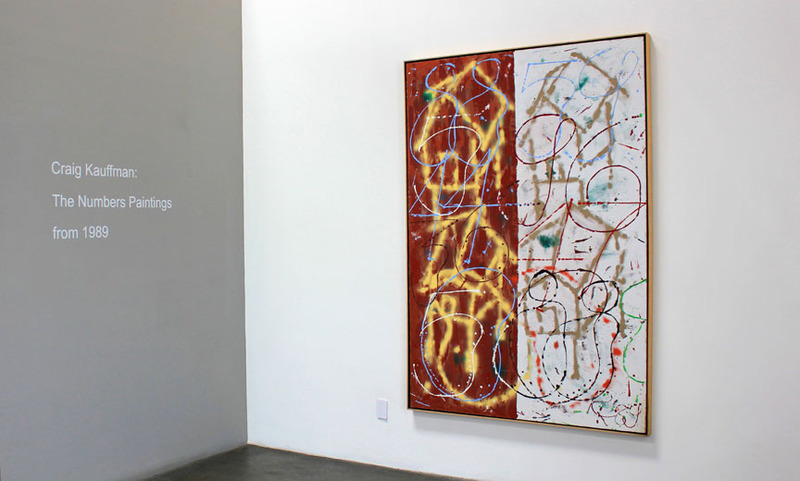 We also brought an unprecedented show of paintings from the late 1980s by Craig Kauffman to the L.A. audience in April. 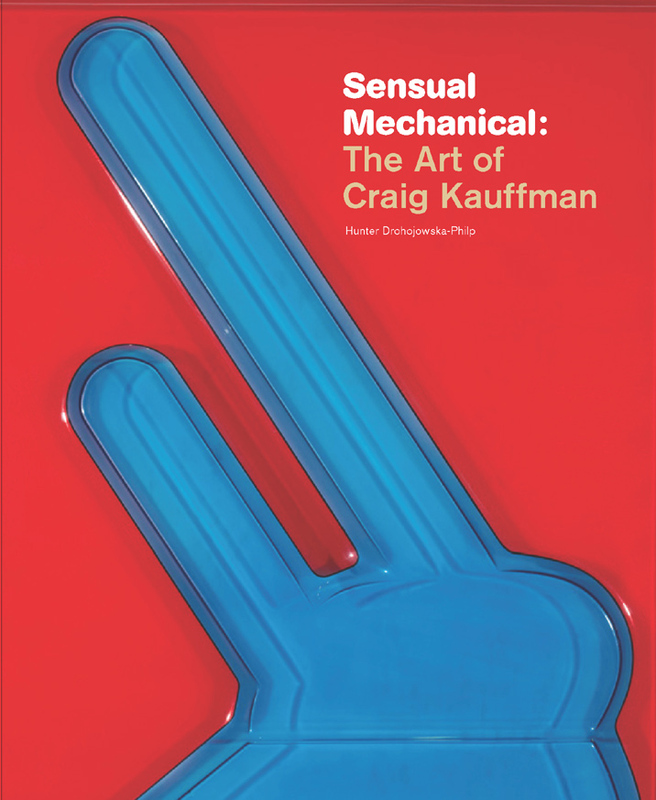 Never exhibited together in the artist’s lifetime, these paintings showed Kauffman’s interest in unorthodox application of paint and his love of the physicality of painting, accompanied by his brilliant color sense. Kauffman considered the 1989 works, which became known as the Numbers, to be a continuation of his use of calligraphic line, and an integration of sensuous color with architectural form. It was a memorable show. 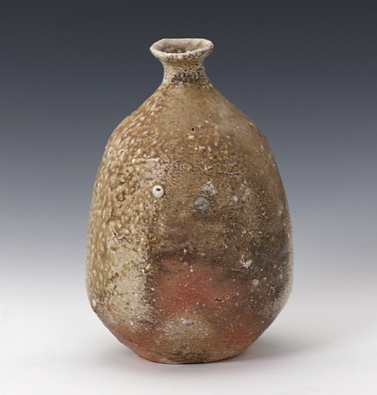 Part two of Frank’s International House of Ceramics, opening January 5th, will feature the work of Sugimoto Sadamitsu. Regarded in Japan as the greatest living master of the Iga and Shigaraki styles, he has received numerous honors in his home country. The gallery hosted the first comprehensive exhibition in the United States of Sugimoto-sensei’s works in February, 2012. 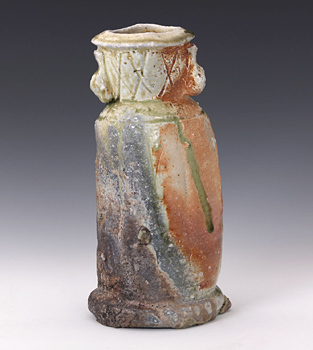 Sugimoto-sensei’s Tea Ceremony vessels were highlighted in a 1989 exhibition commemorating the 400th anniversary of legendary tea master Sen no Rikyu’s passing. His work was then selected for use in the movie Rikyu, about the life of the revered tea master. This honor is significant; it was through the teachings of Sen no Rikyu that the Tea Ceremony came to be a highly studied aesthetic ritual and a way of life. Over four centuries old, the Japanese Tea Ceremony is at the basis of traditional Japanese culture, and epitomizes its highest cultural values. Both the Shigaraki and Iga traditions are contingent on long firings at extremely high temperatures. 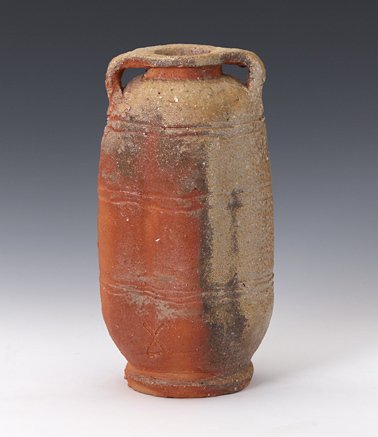 Because no glazes are applied to the pieces, the surface variations are the result of wood ash settling on the ceramics in the hot kiln. The Shigaraki works we are presenting are characterized by their ashy surfaces, while the works in the Iga tradition feature glassy green drips – a hallmark of their outstanding quality. Both styles have a rugged presence, and the finished works illustrate the unpredictable nature of their processes. Some of our American artists are international, too. Though he was born close by in Glendale and still lives in L.A., Adrian Saxe is internationally known. 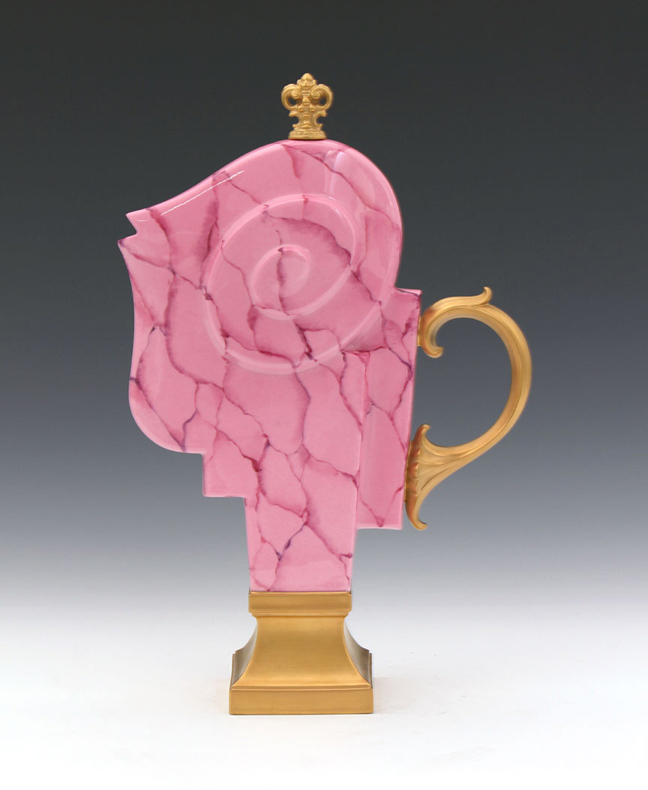 Once dubbed the “Global Potter” by the Los Angeles Times, Saxe has fused together traditions from many cultures, and produced works that are seductive, humorous and intelligent. He often playfully refers to luxurious and regal French culture. 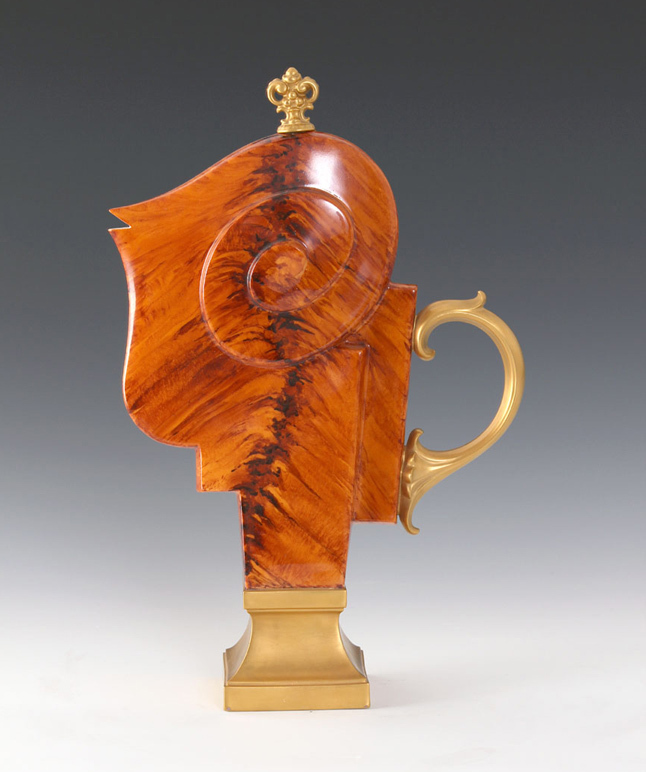 But his experience with that culture came firsthand – back in 1983 he was selected by sculptor Georges Jeanclos to be the first international resident at the Manufacture de Sèvres. Sèvres, the centuries-old French home of court porcelains, opened its doors to foreign artists, allowing them to use the formulas and facilities located just outside Paris. Saxe first encountered Sèvres porcelain in the Huntington’s eighteenth century ceramic collection, and was enthusiastic about the opportunity to study Sèvres techniques in person. 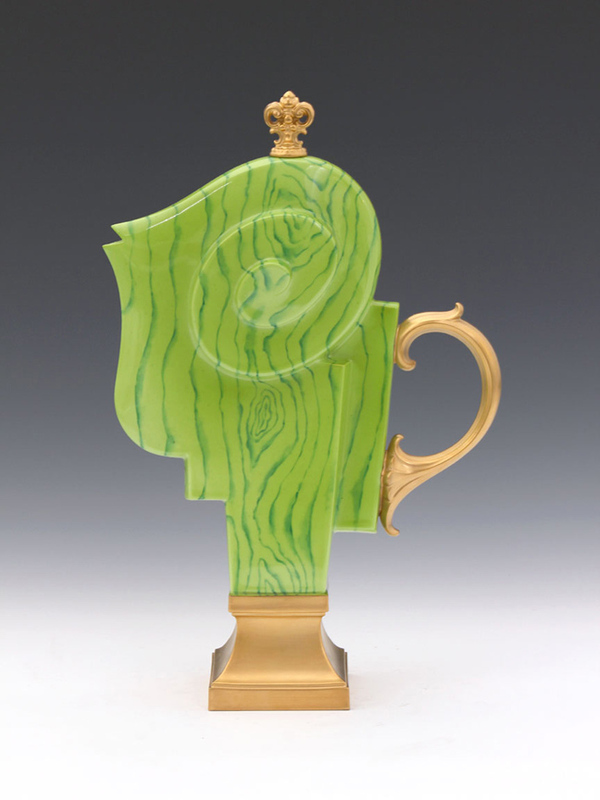 During his time in Paris, he experimented with the hallmark soft-paste porcelain and French-style mold making, and grew bolder in his use of gold lusters and gilding. 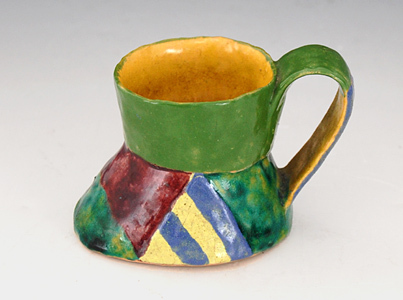 Using the white surface of the material to explore glaze and luster effects, Saxe incorporated the factory’s traditions into his eclectic practice. His time at Sèvres was so productive that he returned to Paris in 1987 for a second fellowship. I’ll be presenting three works by Adrian Saxe from the Manufacture de Sèvres in part two of our group show, Frank’s International House of Ceramics. These Théières were cast in molds from the distinctive soft-paste porcelain, and their surface decoration was applied by the factory’s master China-painters according to Saxe’s patterns. Riffing on the quirkiness of Sèvres forms, Saxe has created a series of Théières that resemble Pac-Man, a playfully irreverent use of traditional resources. They are whimsically crowned with gilded lids, referring to the royal patronage enjoyed by Sèvres at the time of its founding. I’ve written about the Museum of Contemporary Art San Diego’s exhibition Phenomenal: California Light, Space, Surface before, but I recently stumbled upon a couple of videos that reminded me of the beauty of the show. MCASD has produced five beautifully shot and insightfully narrated videos that document some of the challenges and successes of their 2012 exhibition. Robert Irwin, Larry Bell, Craig Kauffman and De Wain Valentine are all highlighted in these videos, which give viewers a chance to relive Phenomenal. Curator Robin Clark and research assistant Christie Mitchell provide illuminating commentary, on the works as well as the kinds of practical decisions that needed to be made. The discussion of natural versus artificial lighting is particularly interesting, as many of the artworks are inherently light-responsive. I especially like the video that pairs Robert Irwin with Craig Kauffman, as the artists were friends and colleagues who enjoyed an exchange of ideas. The Larry Bell video explains the delicate process of setting up his five-paneled installation from 1970. It’s great to hear Larry talk about the experience of installing an older work, and to see the pleasure he still takes in the piece. If you haven’t seen all of the videos produced by the Museum of Contemporary Art San Diego for Phenomenal, I encourage you to take a look at the following link: http://www.mcasd.org/exhibitions/phenomenal-california-light-space-surface-0. Just click “Media” to find the available videos.